The Bradley faithful celebrated after the men’s cross country team qualified for the National Championship last Friday at Newman Golf Course. Photo by Austin Shone. The Bradley men’s cross country team has been grinding away day after day for the last five years. The hard work manifested itself in a National Championship bid on a cold Friday at a snow-covered, mud-stained Newman Golf Course in Peoria. 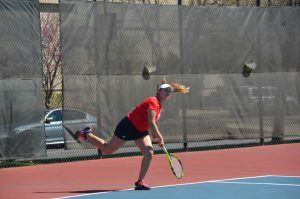 From the start of the race, the Braves formed a tight pack at the top of the field and never backed down, pushing higher-ranked teams from bigger conferences to their limits. The race didn’t come without trouble for Bradley. Michael Ward, a fifth-year senior and the Braves top runner over the course of the season, struggled throughout the race. Bradley finished with five runners scoring in the top 33 spots. Junior Luke Hoffert led the way with a 12th place finish. He was followed by senior Haran Dunderdale (16), twin brother junior Jake Hoffert (18), senior Michael Ward (23) and junior Will Anderson (33). The scoring process was not a simple one. At the end of the race those little positions turned out to be of utmost importance. Almost an hour after the conclusion of the men’s race, the results were still unofficial. While waiting for the results to show up on the board, the Braves huddled in a big group, holding their collective breath, wondering. It was an explosion when the final results were announced. The team formed a mosh pit in celebration as their first ever trip to the NCAA Championship was cemented. Bradley finished second overall behind champion Iowa State and ahead of Tulsa. The second-place finish automatically qualified the team for Nationals. 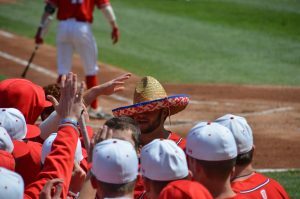 The Braves became the first Missouri Valley Conference school to qualify since 2000. “I thought we had a chance to be third, but second is just a dream come true for us,” Gauson said. Hoffert said that the hometown crowd helped propel the Braves to Nationals. 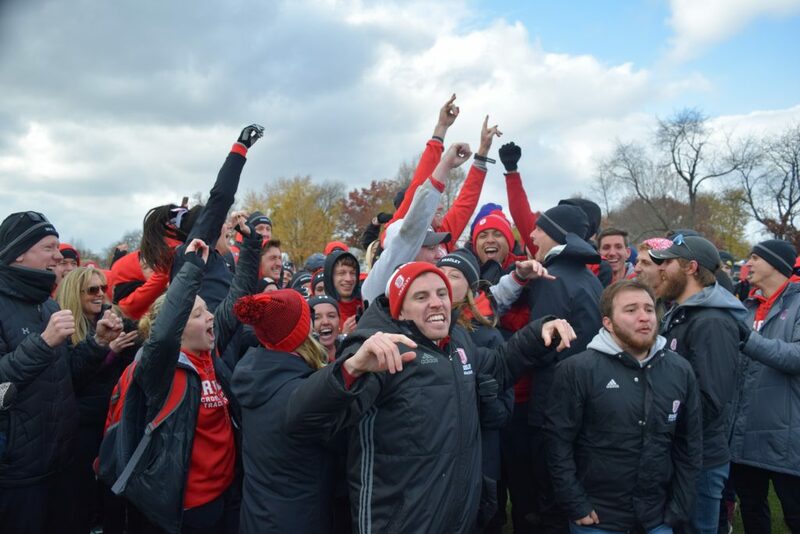 Many Braves noted how special the victory was, not just for the runners but for Bradley, the alumni and former runners who started the program from the beginning. In 2012 Bradley finished in eighth place in the MVC. They were a program with nowhere to go but up. They had runners that were dedicated to making things better than they were when they arrived. Enter Michael Ward and Haran Dunderdale in 2014, two Brits looking for a chance to run at a high level across the pond. “[At that point] we needed people to just believe in the program,” Ward said. Bradley found just that a year later when athletic director Chris Reynolds hired Darren Gauson away from Lamar University in Beaumont, Texas. The results from that point on speak for themselves. Four consecutive MVC Championships. Four consecutive top-ten finishes in the Midwest Region. Everything led up to one race that got them over the top. “This has been the ultimate goal for the past three years, and I think we just set the bar – set the precedent – for the years to come,” Luke Hoffert said. The men will run in a field of 31 teams for the NCAA Division I National Championship at 11:45 a.m. on Saturday in Madison, Wisconsin. The team was ranked 25th in the national poll which included the top 30 teams. This is the first time the team has ever been nationally ranked. “The only bad side is we have to run 10K next week,” Dunderdale said. If the past is any indication, another 10 kilometers will be worth it.